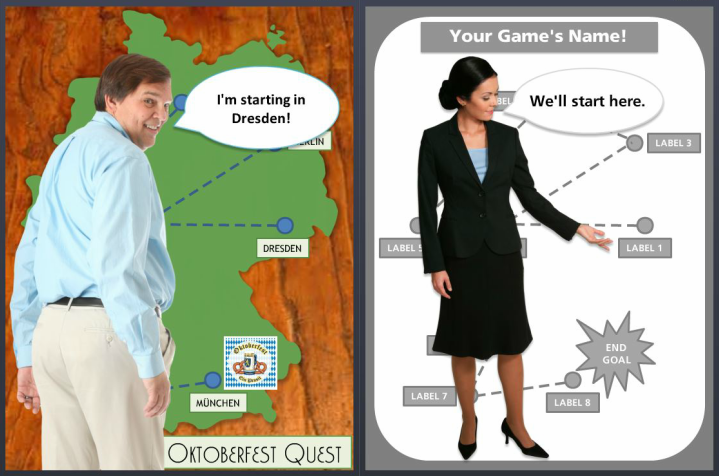 Free "Create Your Own Quest" Game Template - PowerPoint Version! This week's challenge is to take a fully-customizable game template that I created in Storyline and make it into your own game. Here's the challenge: E-Learning Challenge: Steal This E-Learning Template. I just made a PowerPoint version that's as close as I could make it to the Storyline version, and I'm attaching the download file. The template is based on my original German drinking game, and this is a post comparing the two. My video walk-throughs of the German game versus the template. I made them for the Storyline version, but you can still glean some helpful information from them as a PowerPoint user. 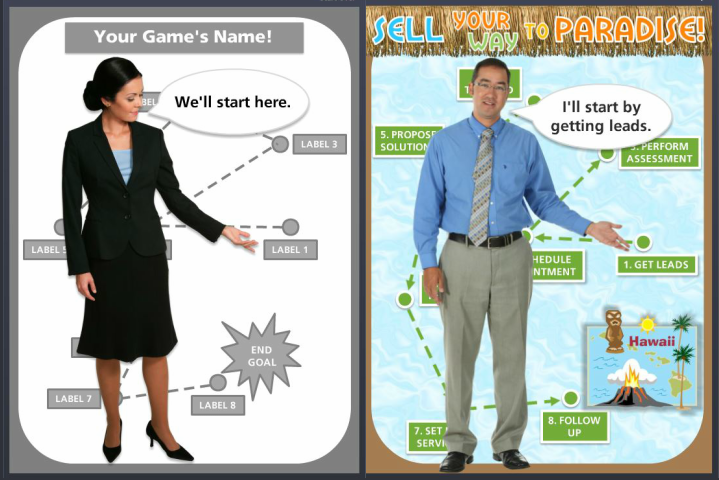 My own challenge entry this week where I took the template and made a sales game out of it. I included before-and-after captures at the end which might be helpful, too. Thank you so much! You are wonderful to have done this so quickly. I will work on my challenge and hope to have something to share by the end of the week. Thanks again! Not often we see custom projects reverse engineered to generic Storyline all the way down to generic PowerPoint but that's how we roll in this community. Thanks for sharing the template, Jackie. Your game template is amazing!! Am so keen to use it in my next instructional design assignment..!! Can't wait to see and hear the reaction of my colleagues! Thank you so much! I'm very happy you'll get to put it to good use and amaze your colleagues. (Colleagues should always be amazed.) Wish I could see the end result! The game board and any other elements that might seem to be "locked" are just on the slide master and very easy to change. Just go to View > Slide Master, and choose the master slide you want to edit. In normal view I believe you'll see them over to your left on the side. Thanks for your question, Shilpa - and have fun! Thought I'd jump in on this one. It is a take on the classic trivial persuit game. I used the built in questions so that it can be tracked and scored. I'm so glad you're jumping in! I know it's confusing with multiple threads about this template, but if you post your entry over on David's challenge page you'll have officially made it in. Over there you'll also get to see the other entries community members have created for the challenge. It's a pretty fun bunch of entries and I'm glad you'll be one of them! Jackie, your astounding creativity can only be matched by your generosity of spirit! You've inspired me so many times, and I thank you for these powerful examples! Thank you so much, Adele - and you're more than welcome! If you find any of this useful or inspiring it makes me ridiculously happy - so thank YOU! I really appreciate your comments. This is just terrific stuff. Love the monster template. It's amazing what you can do! Thanks for sharing. Thanks for sharing Jackie...It's amazing! Jackie - this is so cool! I love that you shared the walk-thru, too. You are awesome, and so is this game! Gary, Ashi, & Kristin - Thank you so much! You've each completely made my day. I'm so happy you like these (and the monster demo, Gary!) and hope you can use them. Thanks again! Jackie, thanks for sharing your work with us! I agree with Adele, your examples are always so inspiring for me, having these templates, this is probably the next challenge where I participate. Thanks again! My pleasure, Cecilia! I can't wait to see what your challenge entry will be!